I grew up in a time when computers, the Internet, text messaging and all of the other impersonal technology we use today was non-existent. This means I remember the good ole days of hand-written letters and cards, and I continue to believe they are more special and meaningful than typed messages or electronic greeting cards. During my recent visit to Maine, I discovered something wonderful! 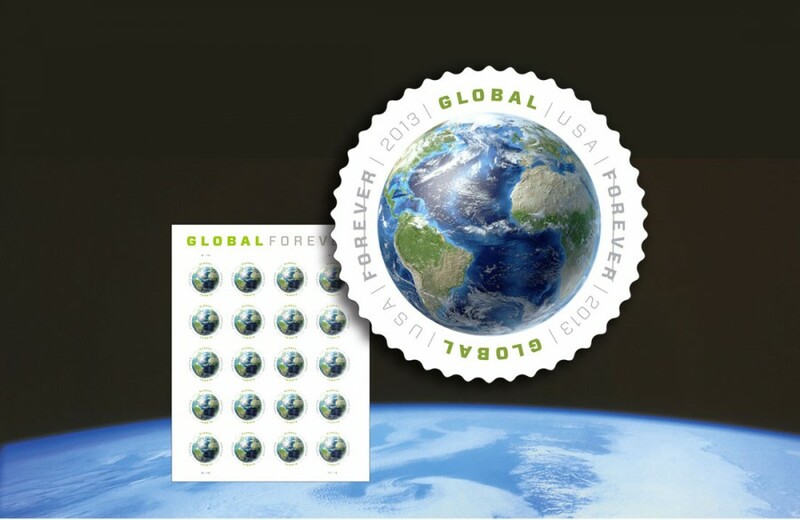 The U.S. Post Office introduced a "Global" stamp, which can be purchased for only $1.10 USD. The stamp can be placed on any postcard or letter weighing up to 1 ounce and it covers the mailing cost to any country worldwide. This means you no longer have to guess about the cost differences to mail a postcard to France, Russia or Asia. With this stamp, the cost is the same no matter the country. Convenient. :) The designs on the stamp vary, but all of them contain colorful images of the globe. 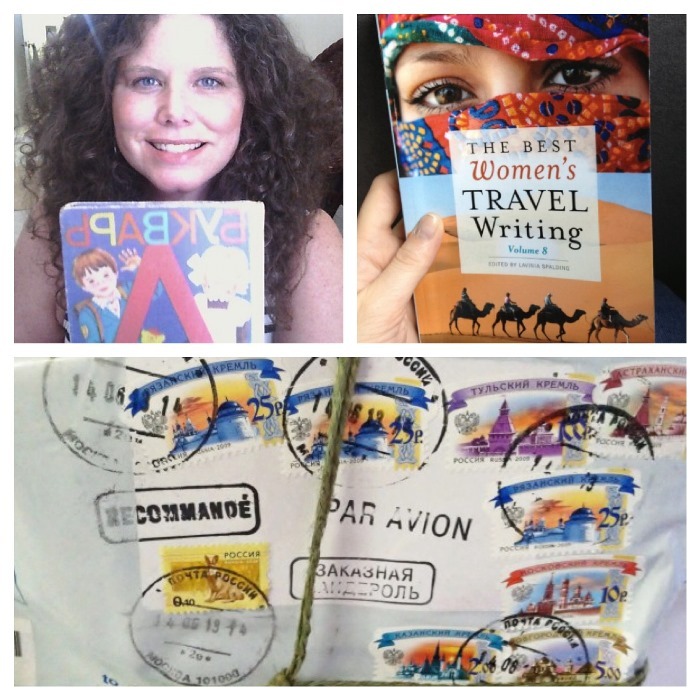 Btw, you will remember that a few years ago I had a fun contest with one of my readers where we sent packages to each other on the same day. It took Russian Post five weeks to deliver my book to her in Moscow, and I received my book in the USA in only three weeks. I'm sure many of you recognize the book I'm holding. :) So many stamps on the Russian package! Has Russian Post improved over the years, or modernized its equipment? You will recall that when I was in Maine, I offered to send postcards to some readers. I sent cards to everyone who responded on the day the post was published. I know at least one person who lives in the U.S. has already received my card. How about my Russian readers? Have any of you received my postcard from Maine? They were mailed over two weeks ago to different cities, including Moscow, Vladimir, Samara and one was sent all the way to New Zealand! I hope they don't get lost and eventually make their way into your hands! In the U.S., it's not "snail mail." Usually, something mailed from the West Coast arrives to me in 3 - 5 days. And now you only need ONE stamp. Don't be lazy! :) It's nice to receive surprises in the mail! Do most major e-tailers (like Amazon and eBay) ship to Russia? Do most major e-tailers (like Amazon and eBay) ship to Russia? Yes, but sometimes Amazon does some exceptions for whatever marketing reasons. But it's not a problem, there are a lot of proxy firms which order to their addresses in the USA and then resend to Russia. BTW in Moscow the whole mechanism of buying from web shops is much more convenient than in the USA. You don't need to use a credit card. You make an order, a courier comes to you and then you can pay in cash. So if you look at the thing in reality and you don't like it or it does not fit you don't need to return by mail, you just don't buy. Interesting. I use Amazon for everything and have a "Prime" account so shipping is free. Very convenient and everything comes via express mail, usually in one or two days. But it would be nice to be able to immediately reject the package if you're not pleased with its contents. I do not pay cash for anything! I use my credit card for all purchases and then pay it off each month. This way, I accumulate a lot of points for travel, which can be redeemed for free tickets and hotels.